To give it to an individual person, go to her profile. When you accept an applicant as a student, you can give her a user account. To give it to a group of students, Populi Account Administrators can use the Data Slicer. Populi's default username format is first initial, last name, and last two numerals of the current year. If you give John Smith an account in January 2018, his automatically-generated username will be jsmith18. To change the default username format, have a look at this article. Check her user status to the right of her name in the gray bar. If she's a user, you'll see a notice saying Active User. If not, click the menu button and select Make this person a user. Select Is a user from the status drop-down. Populi automatically generates a username/email with her first initial, last name, and the last two digits of the current year. Keep this username, or enter another username. Choose an alternate email. The Welcome email will be sent to this address. If you don't have any email addresses entered for her yet, close the dialog box, enter an email address under contact info, then go back to Step 1. To use this option, you must be a Populi Account Administrator for your school. Run a report or load an existing report. The report will return a list of people with the Student role who fit your filter conditions. After running your report, click Columns and add a column that shows Primary Email. If a student doesn't have a primary email address, she cannot be given a user account; including this column will help you find students who won't receive an account for this reason. Click Actions and select Create users. Review the items mentioned in the dialog. If your report returns people who already have user accounts, they will be skipped. Choose the username format. You cannot choose the email address option if your students are not given school email addresses. When you're ready, click Create Users. After creating the users, you'll see the results. This operation skips students who already have user accounts or who do not have primary email addresses. Populi sends her a welcome email. This email contains a link to set her Populi password and log in for the first time. She'll need to log in within seven calendar days of receiving the email. After that, the link expires, and you'll need to send her a password reset email. She can now log in and make changes to Populi appropriate to the roles you gave her. Change her user information (see below). 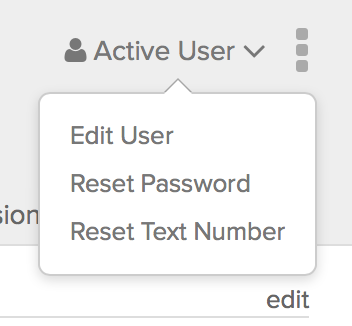 Reset her password—select the email address to which you'd like to send the password reset. If she's required to use login approvals, you can reset her text number—again, select an email address to which you'll send the text number reset. Blocking a user prevents her from logging in (it does not affect any of her roles). Enter a reason for the block (optional). To un-block her, just come back to this dialog box and un-check Blocked. You can control whether a user is required to use login approvals. Read about login approvals in this article. Check next to Login approvals to require it of the user. If they're required, you can un-check to remove the requirement. Your choice here affects only this user; it is independent of the role-level setting chosen by the Account Administrator in Account > Security. Removing user access does not affect anything else about her record. It just means she can't log in and make changes any more! Select Is not a user from the status drop-down. Her email is now permanently deleted and her old username is now available for someone else to use. Strictly speaking, you can't change someone's username. You can, however, remove someone's user access and then immediately re-add them as a user with a new username. You'll follow this same process if you need to change someone's system email address. Give her the new username. Choose an alternate email to which Populi should send the Welcome email. Is your school using Google Apps for Education with Populi? Removing user access will disassociate this person's account from any corresponding account in your Google Apps setup. Neither their email, nor their account, will be deleted. Did these changes cause the last logged in status to be reset? Because a lot of our students say "never" now. It took a few hours longer than expected for the last-login status data to be re-populated. The issue was all fixed up within a few hours of your post. It was! Thank you very much. Love the new features!